There are many opportunities to focus on good character throughout the school year. Small opportunities occur throughout the day and great modeling, conversations and role play can help students learn about being their best. Loyal is often a word that students don't encounter often yet many of them already have the character trait. 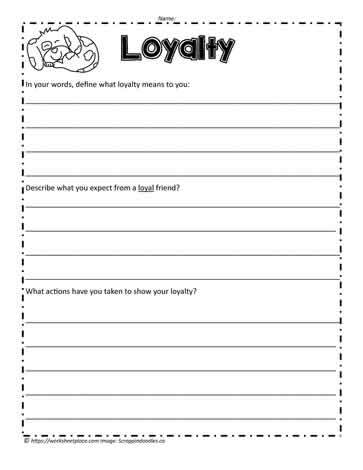 This worksheet focuses on loyalty and what it means to be loyal. Most students will tell you that they want a loyal friend. After all, without loyalty, many friendships are lost. Before begininng the loyalty worksheet, have a discussion about the qualities associated with being loyal.